I told you to stop giving those chicks Quaaludes mid-flight. And you better post the pictures and video – no matter what UA says. Cool. I’ve not been to Omaha. Let’s assume until we hear otherwise that Matthew isn’t that unruly passenger. Someone had too many of these. @Matthew – did you specifically pick this flight due to its higher than normal chances for unruly pax to increase your chances of compensation? If so, how do you know which flights historically have more unruly passengers? Expert Flyer? Flight Aware? TMZ? Passenger, a white male in his mid 20’s was seen running up and down the aisle screaming “balls deep”. As the FBI was pulling the passenger off the plane he was quoted saying “Red Dragon’s Balls made me do it”. I was on this flight. I never found out what happened. Why was the lady restrained in the first place? @Nl: I tried to find out. Captain Fitzgerald and the purser said it had something to do with a toothbrush and toothpaste? Maybe she needed to use the lav and there was a line? I wish I knew. I didn’t mention that above, because it is pure speculation. Where were you seated? @Mike: I’ve been pretty fortunate lately on picking the right flights. Dog the Bounty Hunter on my flight to HNL, Wesley Clark last Friday, and now the crackpot woman who netted me a $350 domestic voucher. I was in row 11. All I saw was the flight attendant holding the woman bringing her from the back of the plane to the middle (bet coach and biz class) section and then they started screaming. And 2 or 3 men jumped up to help restrain her. Then there was the duct taping of her mouth I think. Then she was brought to the back. I too was on the flight – 2A. I had not heard that the woman had tried to open the door inflight! Wow! I understood that she was trying to storm the cockpit and I did hear her claiming to be and “expert from MIT”. One flight attendant told me that she had been a problem on the flight from the time of boarding (wouldn’t sit in her seat/wanted a new seat) and it escalated from there. She made claims that some men around her were plotting to bring the plane down with a bomb. I also heard she made accusations that someone had a chemical weapon onboard (it was a flight attendant that she was accusing). I saw the duct tape being taken to the back where she had been subdued and a few minutes later I saw handcuffs heading back there too (never knew airplanes had handcuffs onboard). When she deplaned I noticed her feet were bare and she was walking as if her ankles were tied together either with tape, handcuffs, or zip ties. I would love to see the video you shot. @anonymom: Another passenger in row 9 did not observe her trying to open the door, but it sure looked like she was trying from my vantage point. Thanks for your comment. @Nl: How far back did they take her? I didn’t see how far back they took her….but I heard the FA (I think it was her) tell the 2 men to take her back to the bathroom. After reading this, I am inclined to think it was just a crazy lady who was paranoid. I know that near her were some people that she probably racially profiling and thought were terrorists. She was just probably a paranoid person afraid to fly…and then went nuts thinking that there were terrorists on the plane, when it was really HER that was creating the disturbance. I was one of the two guys who restrained her. She never attempted to open the door in first class but the FA told the guys near it to guard it just in case. I was also one of guys who had to take his wife off in Omaha. It was only her second flight of her life and she had a panic attack. I guess it is not every day you see your husband wrangle a woman to the ground and hog tie her. I’m glad it worked out and no one was hurt. Thank you for helping us (and the wonderful, yet frightened FA’s). They could not have helped subdue her without you and the other gentleman. I remember her declaring loudly, ” I am a chemist!” Sorry for the belated (years) response, but I am just thinking about the incident. I am happy she is ok. When one hears the pilot over the speaker say: “We have a problem in the back of the plane…”. Well, I started praying. Thank you for your help! @J. Morris: Thanks for posting. Didn’t she attempt to grab it before being restrained? It really looked like she was at least groping for the door (though I thought she actually grabbed onto the lever) from my seat a few rows forward. I hope your wife is okay. Did you receive the apology e-mail from United? 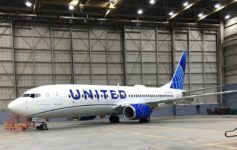 If not, go to united.com/appreciation, enter your details for the flight, and you will see that UA has offered compensation to each of the passengers onboard. I distinctly remember her screaming,” I am a chemist!” Of course, I was saying the Lord’s Prayer out loud at that point. Thank you to the two guys who helped restrain her.